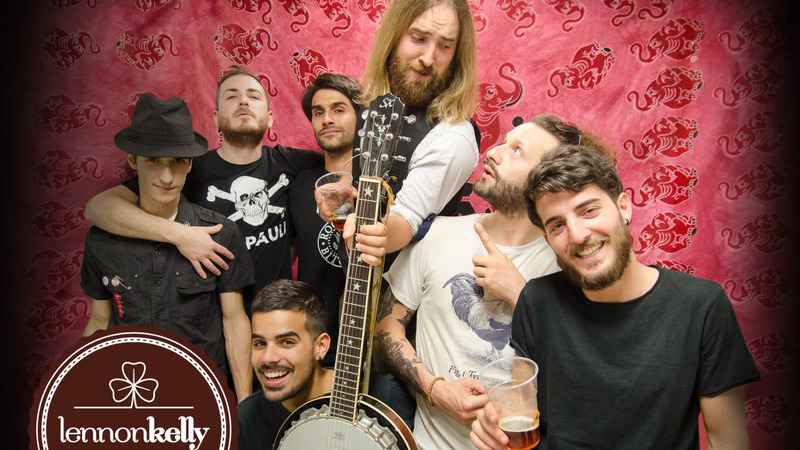 The Lennon Kelly project came to life in 2011 among the green hills of Romagna (more precisely in Cesena) and through a common interest in folk music, Irish music and Romagna folk music of the 7 members of the band. The convivial group thus began, drenched in Sangiovese and whiskey, to blend the different musical influences of each component with the main folk backbone that brings them together and unites them. Their music can be seen as a combination of folk, rock, punk, ska, a good dose of italian songwriting, and a lack of soberness. Thanks to the victory at the Tana Liberi Tutti contest, the EP was mastered at the Tam Tam Studio in Cesena. The EP includes the single “Motivo per restare” (“Reason to stay”), accompanied by a video clip, and the workhorse “Sette nodi” (“Seven knots”). In the first two years the band performed concerts throughout the northern Italy area, sharing the first important stages and serving as opener for various bands (Flatfoot 56, Bandabardò, Statuto, Vallanzaska, Nomadi, Cisco) and made an agreement with the MakeADream booking agency and the IndieBox 360° records which published two tracks in its compilation: “Motivo per restare” and “A ruota libera” (“Freewheeling”). This will allowed the band to expand its borders, landing in the cities of Genoa, Padua, Brescia and Florence taking part to the Irlanda in Festa festival (Padua, Bologna, Urbino, Rimini) for the first time. In 2014 they recorded Galway Girl, a remake of American songwriter Steve Earle’s song. This recording, made at Deposito Zero Studio in Forlì, would allow the band to take part in the Rock in Idro 2014 festival, giving the band the opportunity to share the stage with bands like the Pogues, Gogol Bordello, Ska-P, Pennywise, Millencolin and Snuff. The tour went on in the wake of the EP tracks, of Galway Girl and the revisited Irish folk songs that the band offers in their live shows. In January 2015 the band went back to the recording studio, the Indie Box Music Hall in Brescia with Giovanni “Gio” Bottoglia to record the 10-track album “Lunga Vita al Re” (“Long Live the King”), published in March by IndieBox 360° and distributed by SELF and Artist First. Among the many flagship songs in the album, the track “Sangue e Sale” (“Blood and Salt”) would be the first single, accompanied by a video clip. To highlight also the title track “Lunga vita al re”, “Tra orizzonti e cantine” (“Between horizons and cellars”), which has already been included in some compilations, and “La morte di Corbari” (the Death of Corbari”), based on the poem of partisan Giuseppe Bartoli with the participation in studio of Franco D’Aniello of Modena City Ramblers playing the tin whistle. So they began a tour throughout Italy, with a participation at the Irlanda in Festa in Padua, at the Irish Sailor Fest in Pescara along with Modena City Ramblers and the first concert out of Italy at the S.O. 36 in Berlin with the Italian bands 99 Posse and Banda Bassotti, followed by other performances abroad in Switzerland (Bern, Luzern and Brig) and finally in Hamburg, playing at the Knust for the 10 years twinning party between Celtic Glasgow and St.Pauli football teams supporters.